In November 2007, I took a job working from home and at first I absolutely loved it. Then, when I went freelance in June 2008, I started to mix working from home with working on-site in my client’s offices and gradually I’ve come to the conclusion that I dislike working from home; so much so that I’ve decided to do something about it. After nearly 3 years working from home (off and on) I’ve decided that despite how much more productive it made me it also made me a much duller person. The less I worked from home and the more I worked in client offices the more I began to feel depressed at the prospect of working from home when I had to and not seeing or talking to anyone all day. This comic from the Oatmeal fully sums up exactly what it’s like to work from home: both liberating and frightfully dull at the same time. I’ve put off getting any office/desk space for ages as I’m often only working from home once every couple of months or so and for only 1-2 weeks blocks at a time but for this current project I don’t need to be in the agency’s offices at all for the project duration (8 weeks) so I thought I’d take the plunge. So far I’m absolutely loving it; the office gives me the discipline to start and finish work within normal work hours and not bunk off after lunch and watch too much Come Dine with Me on telly when I fall into a gumption trap. I’m sharing with other freelance web developers so it means if I’m stuck on a coding problem or a business question I can get their advice and that is really useful. I can come and go as I please – there’s no expectations for me to sit at the desk during slow times and if I need to take a walk to think about a programming problem I can without a boss thinking I’m a slacker. Essentially, it’s all the advantages of working from home but without any of the crippling loneliness. It does have disadvantages too, it costs money (not a lot mind, £10 a day) then I have to think about either making a packed lunch or buying it from the local shop near the office (again more money). 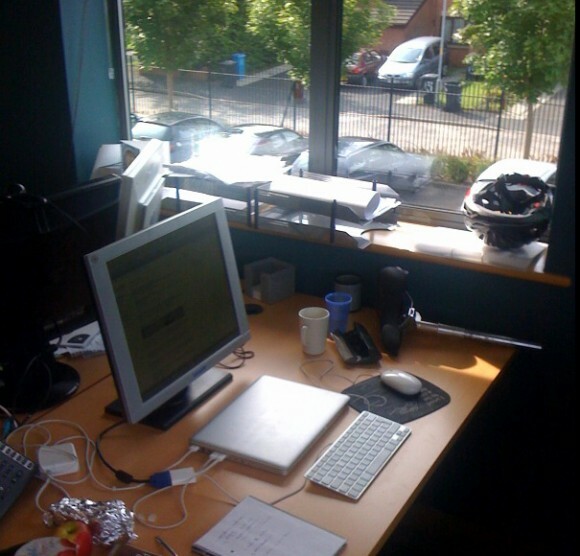 There’s also transport to and from the office – if I can cycle (nice weather permitting) then it’s free otherwise it’s petrol costs/bus tickets which is another few quid a day – basically having this desk space adds £10-£15 to my daily overheads. But right now, I believe the advantages far outweigh those costs. Most of my work requires me to work in the offices of digital agencies and it remains to be seen if there will be more lee way from them letting me work from this office as opposed to in in their offices – I guess I’ll jump off that bridge when I come to it. I have to say the 4 Come Dine with Me episodes is a hurdle I struggle with every day, and I’m liking the idea of normal hours, as I often find myself taking it easy in the morning which results in working most evenings to catch up with my list of jobs. I was the other way round James, dead productive from 9am to lunch then it’d hit mid afternoon and I find it really hard to motivate myself to do anything work related. You’re so right, and have done exactly the right thing. Until you’ve tried the ‘working from home’ thing you just don’t fully get how lonely and sad it is! Friends who work full time envy my position with the freedom it brings, but the downside definitely evens that up. Doesn’t matter I work for multiple clients all the time, sitting staring at a computer screen all day brings my face to face communication skills to a gibbering staring mess! There’s no shared office spaces where I am, so I end up organising lots of coffee mornings with any freelancers and shift working friends I can – those coffee morning mums know the score! Oh, and I just don’t turn the TV on otherwise I get sucked in to Dr Phil.